Zite's iPad application can build a personalized magazine based on someone's interests and social media feeds. San Francisco (CNN) -- CNN announced Tuesday that it is acquiring Zite, a Canadian tablet software developer. Zite offers an iPad application that can build a personalized magazine based on someone's interests and social media feeds. The app can determine users' favorite topics from which articles they choose to read and how they rate each one, similar to the way the Pandora Internet radio station customizes music playlists to listeners' tastes. CNN plans to operate Zite as an independent business, said KC Estenson, senior vice president and general manager of CNN.com, on Monday. In addition to financing Zite's ongoing development, CNN intends to promote the software on the news organization's website and television programs, Estenson said. The Zite app, which is free, will not contain advertisements at first. Zite recently mined app-usage data for a report that showed users' interests by state, information that can be attractive to marketers. The app was downloaded 120,000 times during the week it debuted in March; a spokeswoman declined to provided current user statistics. Zite currently offers only an iPad app. The developers plan to make versions for other operating systems, but the Apple tablet will remain its primary platform, said Mark Johnson, who joined the outfit as CEO four months ago from Microsoft, on Monday. The personalization technology, which Zite has been developing for six years, will eventually be integrated into CNN's own software, Estenson said. CNN's apps, available for major mobile platforms, have been downloaded 12 million times, a company spokeswoman said Monday. But the primary reason for the acquisition, Estenson said, is the Zite app itself. It aggregates news from a wide array of online sources, including CNN and its competitors. 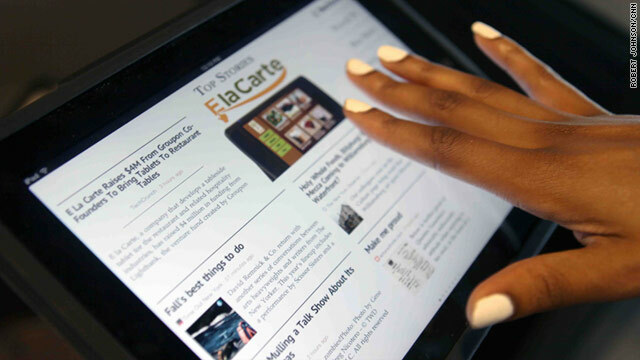 A group of media giants sent Zite a cease-and-desist letter in March, two weeks after the company launched its iPad app. The companies said the repackaging of their news stories was harmful to their businesses and demanded that Zite stop. Zite responded by setting the program to display stories from those organizations as Web pages, rather than formatted without ads within Zite's app. That change resolved the dispute, and Zite has not received any more complaints from the companies, a CNN spokeswoman said. Among the media companies that sent the notice are Dow Jones & Co., which had published a favorable review in the Wall Street Journal for the app's launch, and Time Inc., which, like CNN, is owned by Time Warner. Former Time Inc. executive Josh Quittner left in July for Flipboard, a customized-news iPad app that is a direct competitor to Zite. Shortly after Zite launched, investors were valuing Flipboard at $200 million. Last week, Flipboard CEO Mike McCue told Reuters that his company plans to launch an iPhone app in the next few weeks and that later versions of the software could include television shows and films. Zite was negotiating with venture capitalists on raising a round of funding recently when it formed a business relationship with CNN, executives for the two companies said. Zite was weighing various options, and "it was not an easy get for us," said Estenson, who oversaw the deal. The eight-person Vancouver, British Columbia, startup plans to relocate its headquarters to San Francisco, the executives said. Most of CNN's software development happens at its headquarters in Atlanta, and Estenson said he's "thrilled to be able to set up an office out here in San Francisco." "We thought this was the best way to get Zite to the most people," said Johnson, the CEO. "CNN has the best reach. They've got the financial resources." The website Techvibes reported earlier on talks of the acquisition, saying CNN would pay at least $20 million for Zite. Executives declined to comment on the deal's terms. "This is a bet on Zite but also a bet on the tablet market and the growth of the mobile business and how people are discovering content on those devices," Estenson said. "I find myself using search engines less and less on my tablet, on my iPad. I'm discovering content in a variety of ways."